You want your bathroom to be a functional space, so it has to be bright. That’s why it’s necessary to use both task and ambient lighting. Task lighting should be added around or above the vanity and mirror. This makes it easier to do everyday things like apply makeup and shave. The room has to be brightly lit for these types of tasks. 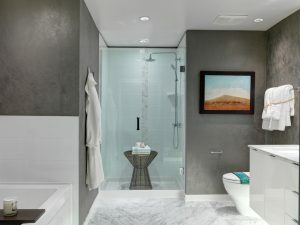 If space allows, you will also want to have a light mounted above the tub or shower stall. Ideally, there should be a light placed at both ends of the tub to create an even cast of light. LED lighting is a great energy saving option. One of the reasons many people have avoided them in the bathroom for years is because they don’t provide the warmest light. However, they’ve been significantly improved over the years. LED lights best used in combination with incandescent bulbs to create the right warmth and coloring in the space. One of the biggest mistakes that you can make when installing lighting during a remodel is not adding enough of it. Having more lighting is better than having less. Use dimmers to make one lighting fixture multi-functional. This is especially helpful if you’re working with a smaller room or on a tight budget. Placement of the lights is also important. If you place a fixture directly overhead of where you’ll be standing at the sink and vanity, it can create a harsh, unflattering look. Determine the most practical spots to install lights that also offer the most flattering illumination.